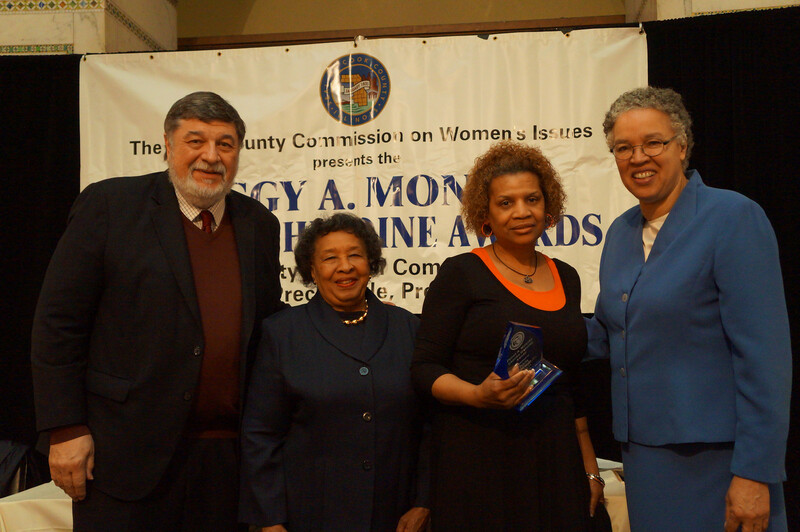 2014 Unsung Heroine Award (L to R: Larry Suffredin, Peggy Montes (Women's Commission Chair), Tricia Edwards (2014 honoree) and President Preckwinkle). Tricia Edwards, performing arts organization founder and Evanston resident, received the 2014 Unsung Heroine Award from the Cook County Commission on Women's Issues. The award was presented by Cook County Board President Toni Preckwinkle. Tricia Edwards, representing Cook County Commissioner Larry Suffredin's 13th District, was honored along with seventeen other women - one from each of the 17 county districts and one from Cook County at large – during Women's History Month. The 17th Annual Unsung Heroine Awards Breakfast was held on March 27, 2014 in the Chicago Cultural Center's Preston Bradley Hall. The event was emceed by Chicago broadcasting legend Merri Dee. Unsung Heroine honorees were selected based on their contributions to their communities, families and professional endeavors that are vital, but seldom recognized. They are drawn from the community they serve. Tricia Edwards was recognized for her nearly two decades of work providing performing arts opportunities for at-risk youth and people of all ages. She founded T.E. & Company Inc. in 1981 as a non-profit Children's Theater Performing Arts organization. Her programs serve inner and outer-city students and help them succeed academically by giving them the ability to choose something positive. Her mission has been to motivate, help and challenge children and develop skills that will help them in the future. Ms. Edwards has written, directed and produced more than 5,000 plays and shows that contain messages about positive attitude and goal motivation. She has produced and created over 5,000 episodes for Evanston Community Television (ECTV) and is very active with youth programs at Faith Temple Church of God In Christ in Evanston. Click here to download a photo.